Tuliptrees are one of the dominant species in the forests in and around Washington, DC. But because the trees are so tall, many people have never seen their flowers. It's worth the effort to find them. 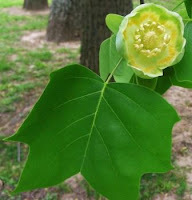 The latin name for tuliptree -- Liriodendron tulipifera -- is all about the flowers: it's a tulip-bearing lily-tree. And with good reason. If they're within reach, the flowers are large and showy -- about 2-3 inches long and shaped like a tulip. The mostly-green petals are set off by an orange stripe. The stamens and pistils are thick, and arranged around a central spike like a magnolia flower; tuliptrees are actually in the magnolia family. If your timing is right, you can get a special treat. Tuliptrees produce more nectar than any other plant in North America, about a third of a teaspoon per flower. Doug Elliott told us this fact one summer, after the flowers were done for the year. 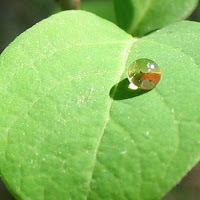 We mostly forgot about it -- until one spring day the next year, when we saw droplets collected on some understory shrubs. This was odd, since it was 3:00 in the afternoon on a sunny day. Sure enough, there was a tuliptree rising high above. So we gave the droplets a tentative taste. Wow! Pure concentrated sweetness. We spent the rest of the afternoon looking for more nectar droplets in the shrubbery, and hit the jackpot when we came to a recently-downed tree: all of the flowers that managed to bloom were conveniently at ground level. Tuliptrees (also known as tulip poplar, but they're not really a poplar) have been known to live to 400 years old, reaching heights of 198 feet and a diameter of 10 feet. We don't have any that big around here -- the old-growth trees were all logged long ago. But the tuliptrees are still some of the tallest trees around. They tend to grow straighter than most of our other local trees, which makes them easy to spot in the forest; it also made them a tree of choice for dugout canoes. The leaves are also distinctive: one of the only leaves that doesn't come to a single point at the end, they also remind some people of tulips. In your yard: If you want to plant a tuliptree, make sure you've got space for it. If you do, you'll be doing future generations a favor. Tuliptrees want sun -- they're a canopy tree -- but eventually, they'll provide great shade for your house and yard. In the wild: You'll find tuliptrees in most woods in the DC area. To get a glimpse of the flowers, you have a few options. Some trees growing on forest edges do have branches low enough to see. Otherwise, try looking from one of the bridges that crosses Rock Creek Park, or from bluffs along Rock Creek or along the Potomac. 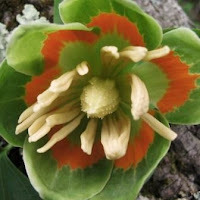 Also keep an eye out on the forest floor when they start to drop -- that's how I saw my first tuliptree flower.